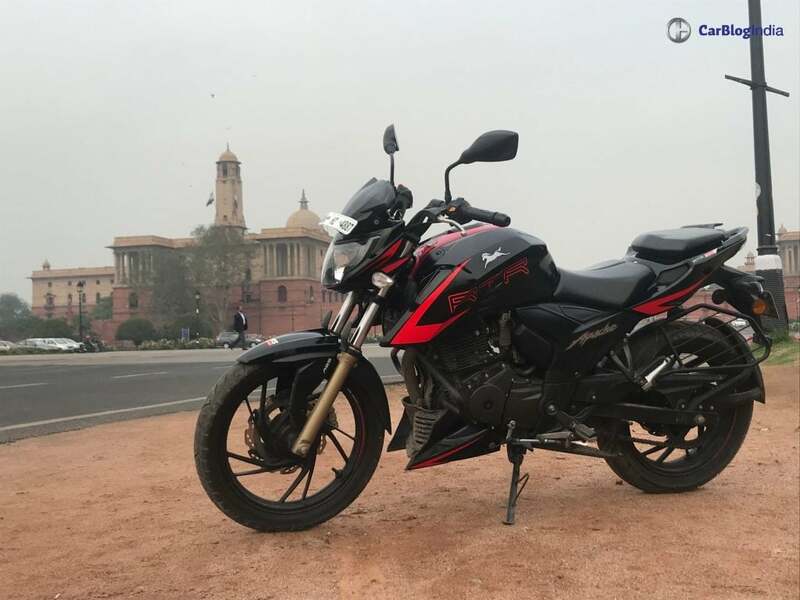 Check out the detailed review of the Apache RTR 200 4V as we put it through our daily routine. Find out if it is more incline towards performance or the city travelling. 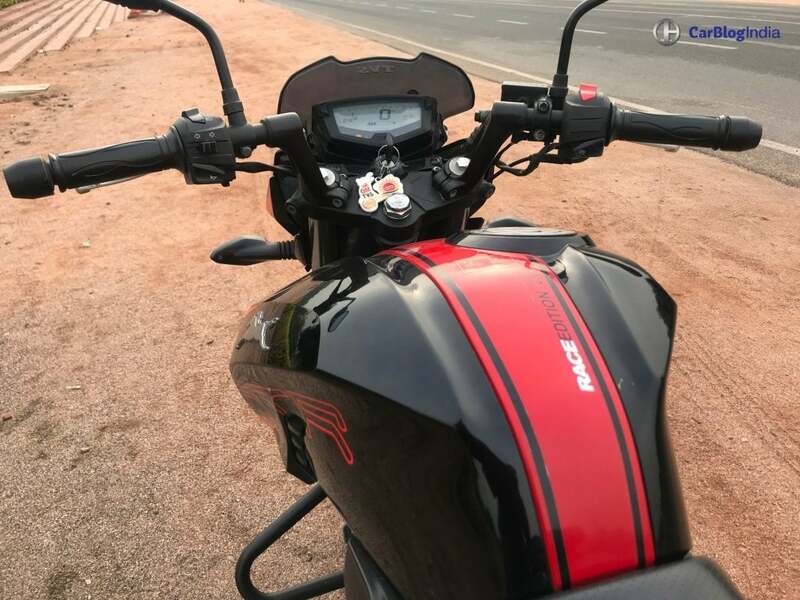 TVS Apache RTR 200 4V. Sportiest of the lot. I had a ‘This is the chosen one’ feeling with the RTR 200. I had a thing for Apaches since I developed an interest in bikes. That would be when I was in 7th standard, around 2010. By that time, the second generation of Apache 160 had been launched. Over the years, TVS has made its most of the two-wheelers more premium than the competitors, at a stiff pricing range. Apache 200, 160, RR310 and Ntorq are prime examples of that. We are late for the Apache RTR 200 4V, but still, we thought of putting it through the daily 80 km heavy traffic commute and some chilly mornings. 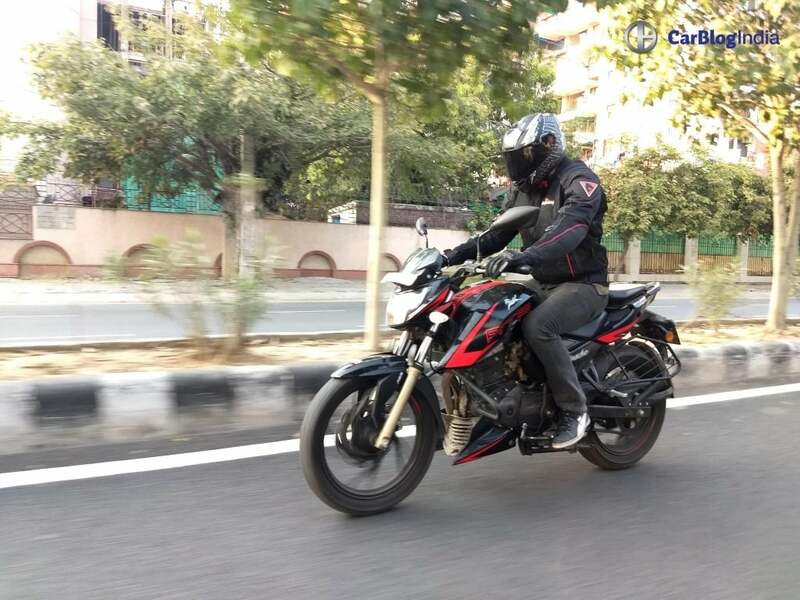 So, here is our road test review of the bike, where we test its performance, acceleration, ride handling and dependability. The new Apache 4V series has grown much more premium and sportier than the earlier set of Apaches. The naked street bike styling looks a change from the half-sporty styling of the RTR 180 and 160. Personally, I find the Apache RTR 200 4V to be more aggressive looking than the 160 4V. The sharp creases with a chiselled body instantly attracted me. At the same time, the odd-looking visor atop the headlamp feels a bit out of the place. My preference is a simple body design with no loud graphics or decals, just the right amount. That’s what is seen here exactly. The tank extensions and the engine cowl work with its sporty behaviour. The split seats get faux air vents on either side, which is a cheeky attempt to make it look premium. Also, to the young riders out there, please go without the saree guard. It looks a bit outdated. 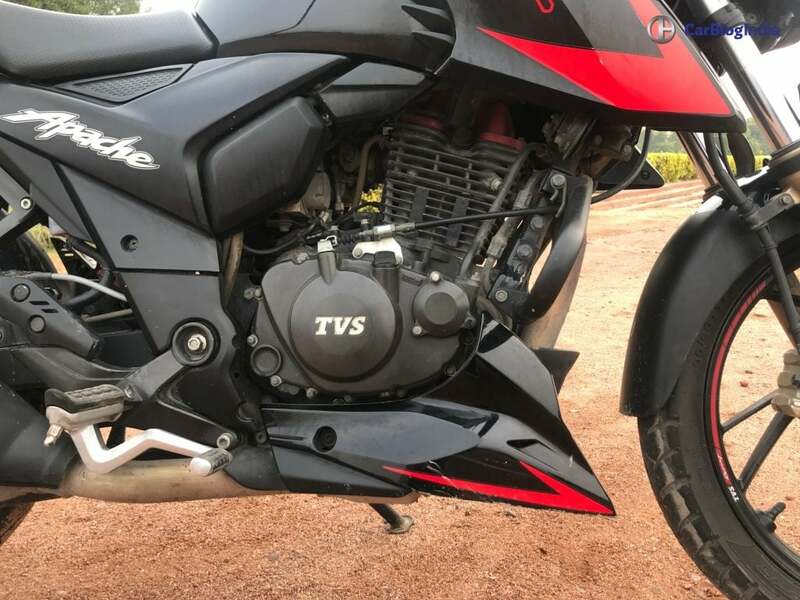 TVS Apache RTR 200 4V uses a 199.5cc oil-cooled carburettor engine, that chugs out 20.05 BHP at 8500 RPM and a peak torque of 18.1 Nm at 7500 RPM. We got the carb engine, which is more performance oriented than the FI version. 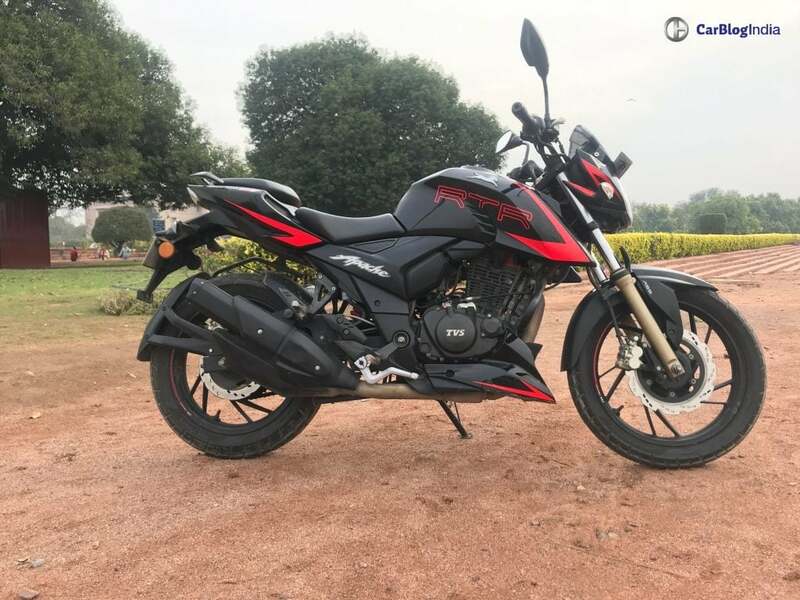 RTR 200 is quick on its toes and actually gives a pretty amazing jumpstart. Starting off at 3000 RPM, you get a sudden gush of torque filling in, till 7000 RPM. This is aided by the shorter 1st gear. As a result, the claimed 0-60 km/hr dash stands at 3.95 seconds flat. However, once you cross the 7000 RPM, it feels like the engine is losing its breath. The acceleration post 7000 RPM takes a fair bit of time. The torque has been focused on the low-end as well as the mid-level. Just till the breath-losing limit, it remains stress-free and quite refined. We would say that its daily cruising speed would be the best near 100 km/hr. Post that, it loses its juice. This says that its best suited for city riding and the often long stretches. Top speed achievable on the bike is 117 km/hr. 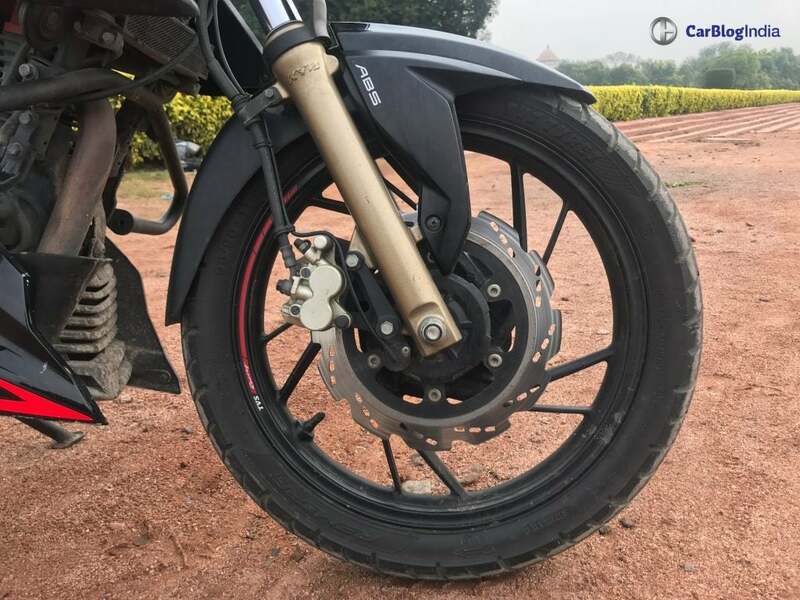 The 2018 RTR 200 gets A-RT slipper clutch, which makes downshifting very easy. You can easily down multiple gears and there would be no engine braking. Riding in daily traffic would be an easy chore over here. Unfortunately, the 5-speed gearbox makes you wanna itch for another gear. The longer 5th gear manages to push it through its top speed, but an additional gear would be appreciated. Still, the work is perfectly done here. 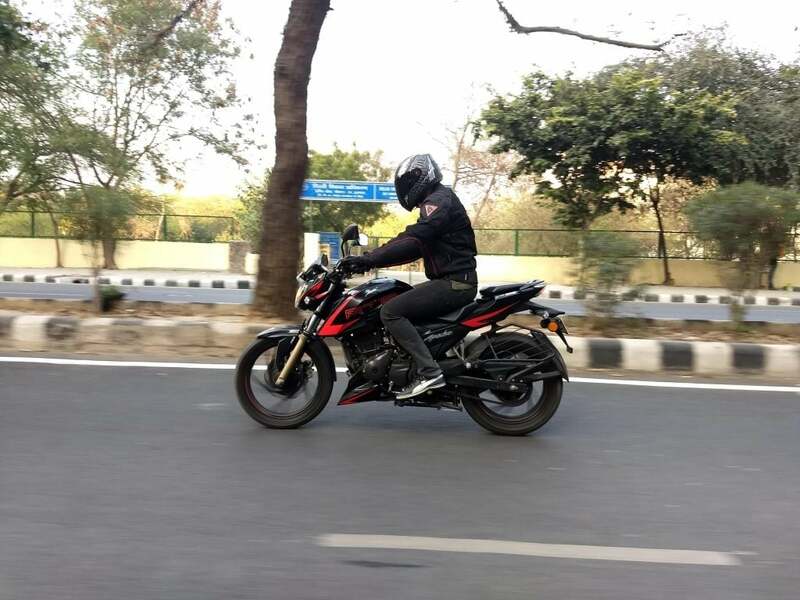 Apache RTR 200 4V returned better fuel economy in the city riding, nearly 46 kmpl. On the highways, we were able to doll out 42 kmpl, which makes it quite efficient. I am getting a feeling over here that if TVS has made it bike for performance or for daily commuting. Anyhow, with a fuel tank capacity of 12.5 Litres, it was able to offer a riding range of over 500 kilometres. The handling on the RTR 200 4V is balanced – commuter friendly as well as performance riding friendly. The footpegs are set high as well as forward, for both the words. The high-placed clip-on handlebar provides a very relaxed riding position. The handlebars are easy to reach, which account for another commuter aimed feature. The sharp front portion of the bike helps in cornering too soon. But, its short wheelbase might create a bit of a problem in the perfect corner. Otherwise, it is quite nimble to handle and can be easily glided through the traffic. Plus the riding posture makes it even easier. TVS has equipped the RTR 200 4V with Remora Racing tires, which are decent for normal road conditions. If a slippery surface or wet roads comes, do not corner it if you don’t have confidence. For suspension, the Apache RTR 200 4V uses KYB telescopic forks at the front and 5-step adjustable rear monoshock, with both the ends set to the softer side. Actually too soft. Normal damaged roads are fine, but slightly bigger potholes are not its thing. Also, the split seats are too cushioned which fatigues the rider as well as the pillion during long rides. The pillion seat is decent for an average sized adult. RTR 200 4V uses a 270mm disc at the front and a 240mm disc at the back, paired with dual-ABS support. The ABS is progressive and keeps your confidence during emergency braking intact. The bite of the brakes is decent, but still, not right-on! At the slightest press of the lever, the bite seems good, but not when the lever is pressed hard. 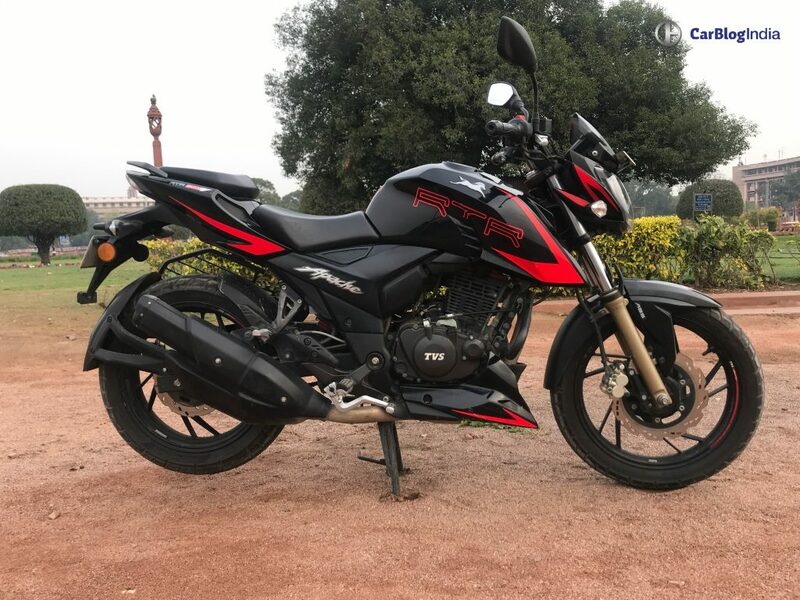 TVS has equipped the Apache RTR 200 4V with a fully digital instrument console, an engine cowl, split seats, LED DRLs, dual-ABS and a small visor atop the headlamp. 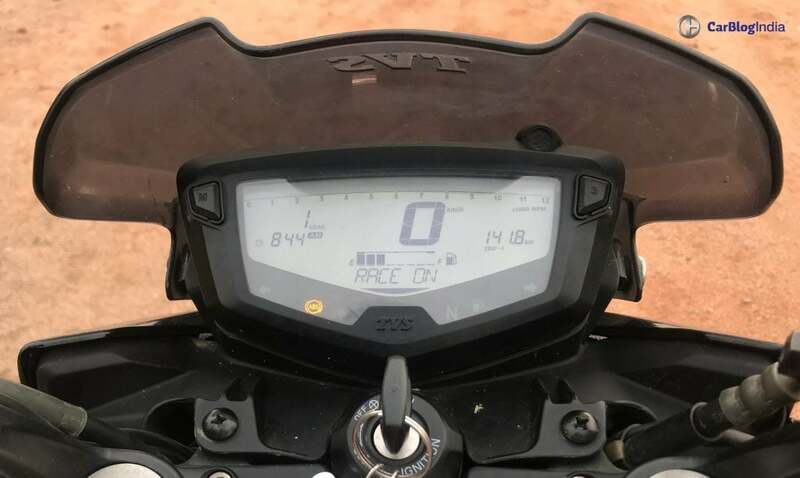 The console gives decent information, including average speed, top speed, time, trip meter, odometer, gear position indicator and a lap timer. So is it worthy enough? Apache RTR 200 4V goes against the likes of Bajaj Pulsar NS200 and Hero Xtreme 200R. In terms of engine specifications, against the Duke 200 too. Amongst the earlier two rivals, I found it to be the best in performance. Of course, the Duke is the even better in performance. I always try to focus on the daily life running of any bike regardless of its engine capacity and type. 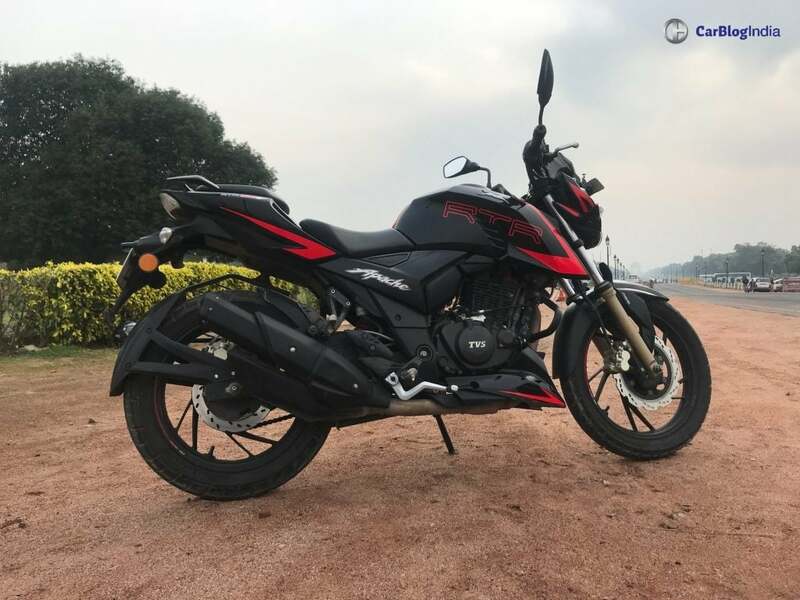 RTR 200 fulfilled my daily travelling needs and I can actually see of owning it for my commute. But I wanted it to be even more performance focused in certain areas like the suspension and the seating arrangement. Nevertheless, at an asking price of Rs 1.11 Lakhs for the top-end variant, it is a very good buy. You get good mileage, premium styling and a capable 200cc engine. But a stiffer suspension, an additional 6th gear and slightly dedicated riding position would have made it a better track-ready machine.